the expertise and efforts of BioSprays, a Biodynamic agricultural application service founded by Lloyd Nelson with Brook LeVan cofounder of Sustainable Settings, a 501 ©(3) corporation that was founded in 1997 that owns and operates the Demeter Certified 244-acres that make up the working ranch and Whole Systems Learning Center. Since it’s inception, Sustainable Settings has researched, demonstrated, and hosted hundreds of educational opportunities on sustainable living including many that include or emphasis biodynamics. Our research and demonstration ranch is at 6,500 ft elevation in the Central Rocky Mountains, a high-altitude and semi-arid climate. Our Demeter Certified, A-2 raw dairy cow share initiative has grown from hand milking 2 cows in 2009 to milking 12 cows with a whole herd of 38 Guernseys, Jerseys, and Dutch Belts. We serve over 100 families with their weekly supply of raw dairy. Our CSA produces veggies, herbs, and flowers for 50 families and we sell in our ranch store as well as to local markets and area chefs. We sell everything we produce within 35 miles. ​Sustainable Settings is also an approved Mentor Farm for the North American Biodynamic Association’s Apprenticeship Program, NABDAP⎯ especially noted as a site for fulfilling the Biodynamic preparation-making portion of the NABDAP curriculum. NABDAP apprentices work and learn in this living laboratory to further their education and have full access to all Biodynamic processes on the ranch and a chance to witness the business side of making and distributing BD preps through Biodynamic Source. We are devoted to continuing the ranch’s long history of and commitment to the practice and education of biodynamic agriculture by conducting our full prep making workshops and seasonal demonstrations. Annually the ranch hosts over 10,000 visitors, and students of all ages. Biodynamic Source is an entrepreneurial non-profit organization that is devoted to the preservation and evolution of Biodynamic Agriculture through our research, demonstration, production and distribution of Demeter Certified Biodynamic preparations that are appropriate for our time. 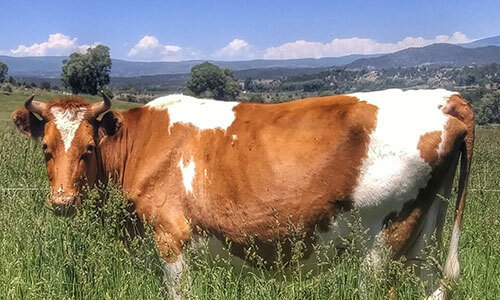 made from plants, minerals and manures grown and produced at Sustainable Settings – a Demeter Certified Biodynamic high-elevation demonstration ranch in the heart of the Rocky Mountains. Our high altitude growing environment is challenging to most plants which has been proven to encourage higher levels of CLAs and other beneficial characteristics in our pasture grasses and vegetables and higher potencies of active ingredients in our herbs, preparation flowers, forbs, and trees. These increased levels of health find their way to our cows for our raw dairy operation and into the manures, horns and organs we use to make our preparations. Biodynamic Source agricultural preparations are made and field-tested by our farmers and researchers at Sustainable Settings, a Demeter Certified Biodynamic ranch. Biodynamic Source offers the first Demeter certified preparations available on the market in North America. Evolving the preparations with our ever-shifting biosphere. Much of Dr. Steiner’s work, especially in agriculture in the early to mid-1920s, was based on Goethean observation. This is still an important method for understanding the wholeness and the effectiveness of our work as gardeners, farmers and food entrepreneurs. In our work we have recognized that the conventional Biodynamic preparations, as first indicated by Dr. Steiner in 1924 are becoming less effective. The shifting of climate, radiation from man made sources, the wide range of toxic chemicals humans have dumped into the natural environment, electromagnetic fields, and other invasions in the natural order has greatly challenged the soil organisms, plants and animals we depend on for food. This shift in our environment is encouraging research in many places and has us field testing stronger doses of the preps and higher application rates. Recognizing this evolutionary shift in our biosphere Biodynamic Source dedicates its work to finding the most appropriate preparations and applications for our time. Starting with the foundational indications that came from Dr. Steiner and through the research of Ehrenfried Pfeiffer, Lili and Eugen Kolisko, Hugo Erbe, Alex Podolinsky, Hugh Courtney and most recently for us from Enzo Nastati who has come to the USA to share his ground-breaking research, we are running trials testing the viability and difference of these potentized preps. Based on these important additions to the science behind Biodynamics we are developing homeopathically stronger, more potent preparations to aid farmers and ranchers in their Biodynamic work. These are preparations that are configured more for the state of the world today. It is also our mission to continue to research and test so that we may keep pace with our ever changing environmental conditions, so that we may provide the most appropriate and highest quality agricultural preparations and continue to advance Biodynamics in North America. It's our mission to find the optimum preps and there appropriate applications in order to heal the earth/ the life on planet in it's current and evolving condition. To accomplish our goals of preserving and advancing the use of Biodynamics and BD preparations in our region and beyond we have made the commitment to create and run BiodynamicSource.org, a Biodynamic preparation making and distributing enterprise with a focus on education and the research into methods and practice that produce high quality preparations appropriate for our time. We have formed this organization as an entrepreneurial non-profit entity as we believe that for Biodynamic agriculture to thrive and keep pace with demand that it needs todiversify its sources of high quality inputs and education and become economically viable. The critical need for quality preparations and continuing education in the benefits of Biodynamic agriculture cannot forever rely on the occasional good will and volunteer labor of love that periodically shows up on a farm here and there. There is need for a committed collective effort to preserve this practice. To that end we propose to forge a viable and replicable model for others to follow. Our seasoned team of key staff members merges 40+ years of experience in Biodynamic agriculture and preparation production and application and sustainability education. We are merging this effort with the national reputation of Sustainable Settings and its physical resources of land, water and organizational and business expertise to create a successful enterprise. Our team is made up of members who are nationally recognized for their experience in making quality preparations and for their tireless efforts to share their knowledge and wisdom through conducting workshops, lecturing and demonstrating the benefits of Biodynamics. We have also confirmed the commitment of land and gained the permission to grow and develop the necessary facilities to realize the optimum conditions for making and distributing preparations, and site utilization to demonstrate and conduct educational offerings. The preservation and advancement of Biodynamic agriculture hinges on the availability, the making, distribution, and the application of quality Biodynamic agricultural preparations that are designed for our time. For many years now we have watched on as the state of preparation making and using in North America has shifted. In our recent participation in both the North American Fellowship of the Biodynamic Preparation Makers and the North American Biodynamic Farming and Gardening National Conference in Louisville, KY in November, 2014 we came away concerned about the state of BD preparation production and distribution in North America. The Fellowship gathering made it particularly clear that the state of preparation making and distributing nationally is in a tenuous state. Our concerns were heightened even more during the Biodynamic National Conference. There we heard about the exponential growth of Biodynamics across the continent. This is being driven by the increasing demand for the Demeter label as more value-added food entrepreneurs and health conscious consumers are searching for more scrutiny in safe and healthy food certification. This increase in market share for biodynamic products is also driving more farmers and ranchers to transition to Biodynamics each year. ​Demeter Association, Inc. is the United States’ representative of Demeter International. We are a not-for-profit incorporated in 1985 with the mission to enable people to farm successfully, in accordance with Biodynamic® practices and principles. Demeter’s vision is to heal the planet through agriculture. Demeter USA is the only certifier for Biodynamic farms and products in America. It is part of a world-wide organization, Demeter International, that was first formed in 1928 and named for the Greek goddess of agriculture, to advocate Biodynamic agriculture and to certify Biodynamic farms. Demeter remains the oldest ecological certification organization in the world, active in fifty countries around the globe. Demeter was incorporated in the USA as a non-profit in 1985. While all of the organic requirements for certification under the National Organic Program are required for Biodynamic certification, the Demeter standard is much more extensive, with stricter requirements around imported fertility, greater emphasis on on-farm solutions for disease, pest, and weed control, and in depth specifications around water conservation and biodiversity. As consumers gain more understanding about the Biodynamic requirements and more experience with the quality of Biodynamic products, farmers and brands are beginning to feel that Biodynamic certification is all they require.